Lucy Pet Products, Inc. is a family owned and operated company based in Thousand Oaks, California. President and founder, Joey Herrick also founded The Lucy Pet Foundation, whose mission is to reduce pet overpopulation and the euthanasia of over 80,000 cats and dogs per week in the United States. Do these products contain any parabens, sulfates, phosphates? No. The Shampoos or Leave-In Conditioning Sprays DO NOT contain parabens, sulfates, phosphates or other harsh chemical ingredients. Net profits from the sales of Lucy Pet Products go to help fund the Lucy Pet Foundation, whose mission is to reduce pet overpopulation through mobile Spay & Neuter clinics as well as funding other animal related welfare organizations. *net profits are profits after operating expenses, interest and taxes. The proceeds will go to the Lucy Pet Foundation. How much is being donated? All of the net profits (after taxes and operating expenses) are going directly to the Lucy Pet Foundation. Does Lucy Pet Products perform any laboratory testing on animals? Do you have a skin sensitive formula? Why Does the Blue Lightning formula contain Blue 1 and Red 33? What ingredients are in the Leave-in Spray that helps the coat? What is the thickener that is used in the shampoo formula? They use sodium hydroxide as a thickener. Can the metal bottles be recycled? Do you use natural ingredients? They use natural ingredients to formulate our grooming products, along with a blend of safe and effective synthetic preservatives to prevent rancidity, bacteria and fungi for the duration of the shelf life. However, these synthetic preservatives only represent a very small percentage of the total formulation. Are these products ‘all natural’? No, since they use safe and effective preservatives their formulas cannot be considered 100% natural. However, these only represent a very small percentage of the total formulation. I’ve seen other grooming products claim they are “all natural” Why aren’t yours making that claim as well? At Lucy Pet Products, they want to always be honest and transparent with their consumers. They use safe and effective preservatives in their formulas to ensure they remain shelf stable. If grooming products do not use safe and effective preservatives, they would become rancid, break down, and could develop microbial bacteria or other nasty things in a very short time. Some brands claim to use “natural preservatives” but after a closer look into those formulas, they have found that some brands are not being fully honest with their consumers. They have not found a single “natural preservative” that enables the product to be shelf stable after 3 months. They prefer to be fully honest and provide safe grooming products that will be healthy, safe and effective whenever you purchase them. While they do use a mild preservative, these only represent a very small percentage of the total formulation and are commonly used in most human skin and hair care personal products. Both the shampoo and conditioning lines are proudly manufactured in California, in a state-of-the-art modern facility that is solar powered and environmentally friendly. 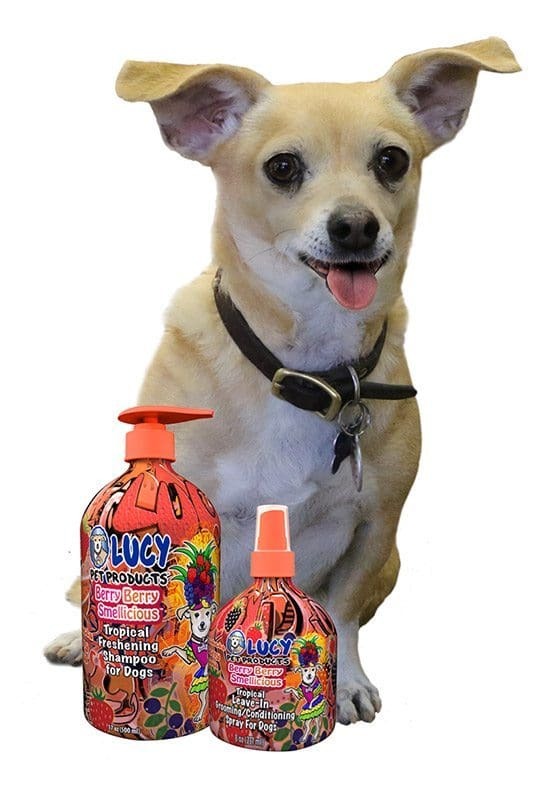 Where can I purchase Lucy Pet Products Shampoos and Leave-In Conditioners? Can your Shampoos and Leave-In Conditioners be used on cats?